I will walk you through the steps of making 2 different wedding cake recipes from scratch in this article. The first one is to make a white wedding cake and the second one for a chocolate flavor cake. If you’ve been on this website before, you know how I like to provide economical and easy ways to achieve stunning results. These recipes reflect that as well. How to tier a cake! If you’ve never baked a cake before, this cake batter recipe is the best way to learn how to do it. It’s a plain, simple and cheap batter recipe that you can adapt by adding your favorite flavor. 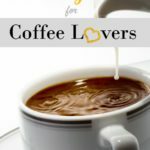 Moreover, I will show you some of the flavors that are the most popular and delicious (obviously 🙂 for wedding cakes and cupcakes later in this post. This is a basic batter recipe. The following ingredient amounts allow you to make two 9-in diameters (round) cakes. The reason why you want to make two pieces is to be able to put one cake above the other and have a nice 4-5 in of height cake. Don’t try to make one thick cake by putting all the batter in the cake pan at once to save time. Your cake won’t cook evenly and you will end up losing more time and money as you will need to do it all over again. Also, the batter gains volume while baking. That’s why you shouldn’t fill the mold to the top. Otherwise, you will end up cleaning a mess in the oven and throwing your cake in the garbage. So follow the steps carefully so you have a pleasant cake baking experience! Adding vanilla extract is not mandatory to make this recipe but it will add a nice flavor. It’s especially recommended if you plan to make a naked cake. If you don’t want to add any aroma to the batter, it’s completely fine! You can add flavoring of your liking later into your buttercream preparation. For a summery aroma, add the zest of two lemons. This step is completely optional and up to you. Taking a wedding cake recipes from scratch like this one is certainly the best way to learn on all small but helpful details. This following steps will make it much easier for you to pull the cake out and also for cleaning the pan after use. Cut a piece of parchment or wax paper the size of the bottom of the. pan. Make sure it’s not too big so it sits well at the bottom. Put it away for now. Use a non-stick spray or shortening and spread it inside the pan. Once you’re done, you can also add a little bit a flour in the pan. Simply move the pan from side to side to make it stick to the greasy bottom and sides. Add the piece of parchment you previously cut into the pan. A good and cheaper alternative to the stand mixer is an electric hand mixer. In a bowl, whisk the flour and baking powder. Put aside. Once eggs are starting to look somewhat homogenous, gradually add the sugar while beating in between each portion you add. You will now want to add the flour and baking powder to the eggs and sugar mixture. You’ll need to add alternately in the flour/baking powder mix in three additions. 6. Using a fine mesh sifter, sift the 1/3 of the flour and baking powder mixed earlier into the eggs and sugar mixture. Then fold it in before adding another batch. 7. Repeat 2 more times the previous step, or until you added all your ingredients. 8. Scrape the sides and bottom to ensure everything gets well mixed. 9. Keep folding until you get a uniform texture and that there are no more traces of flour to be seen. 10. Add half of the batter to your 9-in cake pan. If you’re unsure how much cake batter you got, use measuring cups to know exactly how much you should put in your pan. If you happen to have two same size pan simply fill them equally. 11. Put the pan(s) in the pre-heated oven on the middle rack for 25 minutes. Do not use the fan setting. Fight the temptation of opening the oven door. I know it’s hard to resist especially when that yummy smell starts to fill the kitchen, but please don’t. This can really ruin the baking process. Wait until close to the end. 12. Once your cakes are done cooking they should have a nice dark gold color. Using your finger, apply a little bit of pressure in the center. It should be soft and spring back when you remove you finger. 13. Let the cakes cool in on the countertop on a cake cooling rack away from air drafts. 14. Using a regular bread knife, level the cakes on both sides to ensure they are flat. Once your cakes are leveled you can easily put one on top of the other. You will then be ready to decorate your cakes with fondant, buttercream and icing. You can also decide to freeze them and decorate them later. Simply wrap them in a food packaging plastic film and put them in the freezer. You have now finished cooking your wedding sponge cakes. Now comes the time of frosting them. This next recipe is just as simple as the batter recipe i showed you earlier. The real difficulty here is not to eat the buttercream before decorating the cake! 3. Gradually add milk until you get a smooth and spreadable texture. Stacking a wedding cake may look complicated at first. Honestly, I think it requires delicacy and patience more than skills. 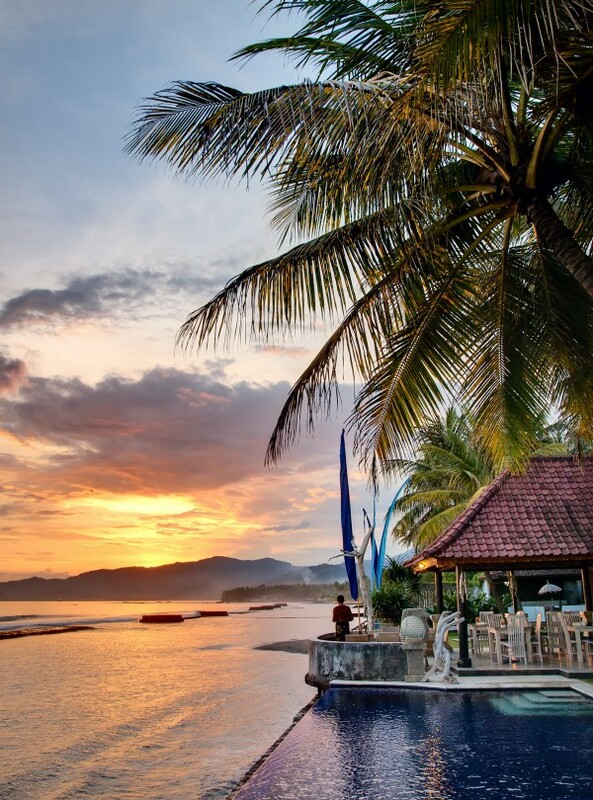 The artistry and finesse come with time and experience so do not be discouraged. You may be surprised to know that you can stack a three-tier cake by using 7 wooden dowels. I will show you how it’s done further with detailed graphics. But first, these are the necessary steps to complete prior to starting stacking your cake. 1.Assemble the two same size cake layers by spreading a thin buttercream layer on the top of one cake. Then, put the other cake on top. Also, remove any excess buttercream. 2. Secure the cakes on cake boards by applying a patch of buttercream on the cake boards. Cake boards are very handy: they provide a safe place to put your fingers while applying the buttercream. 3. Cover your cakes with buttercream or fondant. You’ll be needing seven 12-in long cake wooden dowels. These are sold online or at your local cake store. 1. Insert three dowels inside the largest cake (the basis) in a triangular design. Push until you reach the cake board. You may need to put more if you feel like the center part of the cake is not as compact or sturdy as it should be. 2. 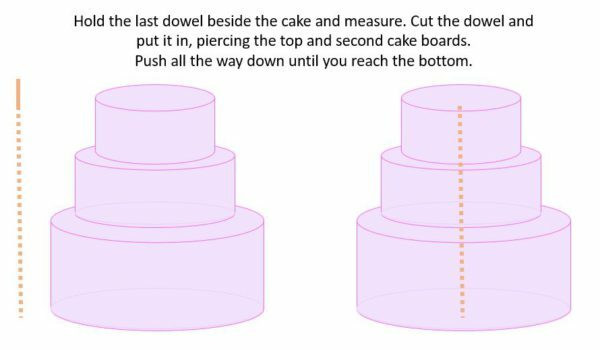 Mark the dowel by slightly scratching the surface with a sharp clean tool (scissors, short knife) as close as possible to the top of the cake. 3. Remove the dowel and cut it a just below the mark. 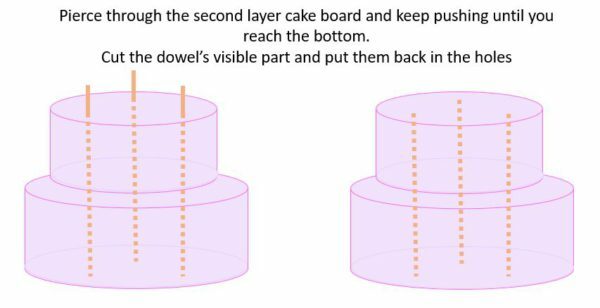 The idea is that the dowel should sit at the same level as the top of the cake when you’ll put it back in. Not to low as they won’t be supporting the weight well and not too high as you don’t want to have your cake tilting on one side. 4. Repeat the previous steps for the other two dowels. 5. Put the dowels back into the holes. 7. You will need to insert your three dowels in a triangular shape as done previously. The only difference is that you will need to get through the cardboard and a little bit further into the cake at the bottom. Wooden cake dowels usually have a sharp side for that purpose. If not sharpen your dowels so that they can easily pierce it. 10. You’ll be using one last dowel that will get through all the cake layers. The role of this dowel is to ensure the cakes stay straight. It has to cut through the last and middle cake cardboards and go all the way down to the last layer. You will still need to cut the dowel but this time you simply cut it so you don’t see it at the top. As long as it goes through all the cakes and that it does not show at the top, you’re fine! Making a special shape cake is a very good option to have a stunning and one of kind cake at low cost. Once the batter is baked sky is the limit. You can choose to make a multi-layer cake using two different heights of cake. For example, a typical 10-in basis that is 3-in high and a 6-in top layer that is 8-in high. This adds magnitude to the cake without having the pyramidal shape we usually see at most weddings. Another idea is to shape the cake yourself by cutting it into whatever you want. On the other hand, you can save time by using a unique cake pan shape to ensure it looks perfect and professional. Almond and Vanilla are very popular for white wedding cakes. These extracts are clear and perfect for a white cake. The perfect scent for a summer wedding cake! Zesty flavors bring a lot of personality to any pastry. These smells are also known to boost energy and enhance the mood. 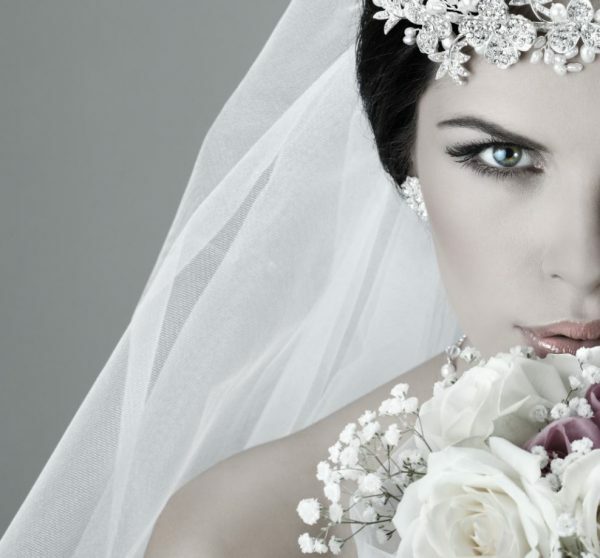 perfectly suited for a wedding party! A truly irresistible taste of butter and brown sugar. There is something very autumnal about it. Also, it pairs well with spicy flavor like cinnamon and cloves. It works very well with dark rum and whiskey too. Last but not Least… Chocolate! I won’t bother explaining why this delectable flavor would be perfect for a wedding cake! Learning how to bake cakes and pastries, in general is a trial and error process. So don’t be too hard on yourself, even the best baker’s made indigestible cakes before they started mastering the technique. What makes a cake dry and what to do to have a springy and moist cake next time? Make sure you measure the flour and level it with a knife before adding it. Overbeating and at too high speed may also cause the cake texture to become dry and crumbly. For example, folding is a step that should be done manually so you can see how the mixture is transforming to the exact texture you want. Finally, oven temperature and time are definetaly aspects you will need to experience with. In fact, more often than not, ovens don’t all cook the same way. This means that your mother’s oven may make perfect cakes at 350 degrees for 25 minutes, but yours should be set to 335 degrees for 30 minutes. That’s what you need find out . Why does a cake sink when taken out of the oven? 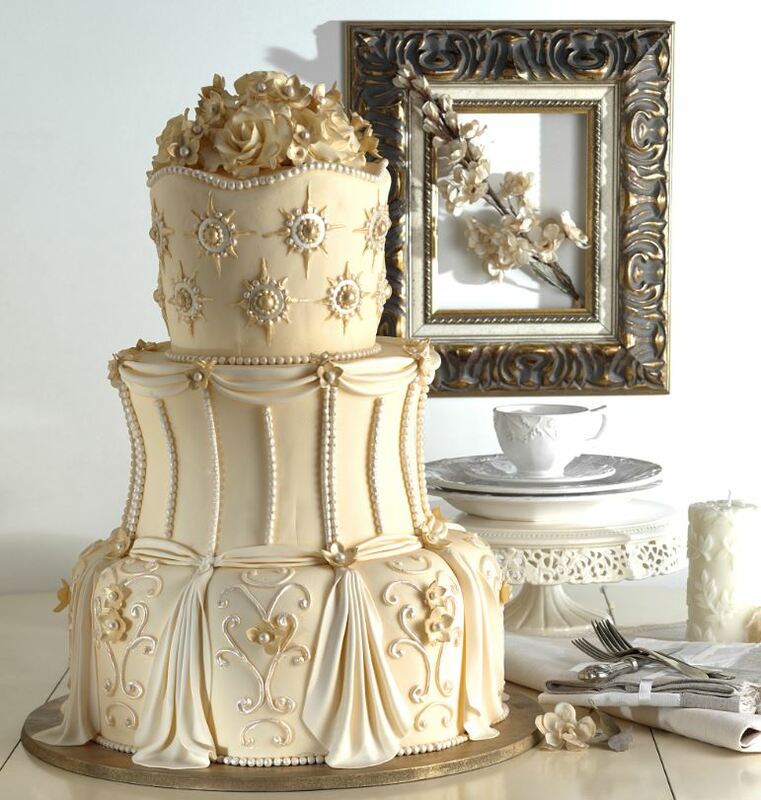 Have a look at this post for more affordable wedding cake ideas . If you’ve been looking for a wedding cake recipes from scratch you were most likely looking for a very detailed step by step procedure. Let me know how you liked this article. Does it answer all your questions? If not reach out to me by leaving a comment in the section below.